I can't for the life of me figure out why, but I love trees! I especially love photographing them, and if I could paint them, I would do that too. Luckily, Hillary from Hilaria Galleries holds that special talent! Hillary is giving a lucky reader an 8x10 print of her "Literary Captivation". Oh, how I envy the winner! For a chance to win, please visit Hilaria Galleries and leave a comment here with your favorite print. *Congratulations to our winner, Katherine! The Farm Truck Vintage Harvest Hay Field Open Spaces print is my favorite - just love the vibrant blue of the sky!! My mom is a reading teacher...I think this would be a wonderful gift to her! I also like "Bringing in the last of the wash". How beautiful! I like Primavera. I love the Coffee and Donut print. The Miro and Klimt Fused is my fave. Like on FB (Suzanne Gregg). I really like "The Quail Amongst Pink Blooms". I love Wistful Evening...Print of a Little Girl Swinging at Dusk. My favorite print is actually the Literary Captivation print. It combines two of my favorite things- reading and silhouettes. I like the Wistful Evening one. I love the Grand Oak at Close of Day! :D The colors and style are lovely. I love the NEW..11 x 14...Created just for YOU...COMMISSION Custom Original Kids Childs Children Whimsical Contemporary ART Modern Painting, the owl is so cute! I just love "A Quick Walk in the Autumn Woods"
I really love Perched Among the Cherry Blossoms. the colors and the shapes are great. I love walk in autumn woods! A Quick Walk in the Autumn Woods is the one I really like though the artwork is stunning!! I Like Hilaria Galleries on Facebook. This one is GORGEOUS - the peeking into the sanguine forest. Amazing work! my favorite is the Cherry Blossoms Bursting....Fabulous Modern Abstract Art Postcard Sized Print. The Olive Perch is gorgeous. Bringing in the Last of the Wash... Contemporary Modern Art Tree Print by HD , this is so much of my evening life in the spring, summer and early fall :) it is just lovely and such a nice time of day - peacfull and cool and quiet! I love it. I love Graceful Sentinel at Dusk. Thanks for the giveaway! I am also a follower of Haute Whimsy! My favorite print is A Quick Walk in the Autumn Woods! I like the Undulating Swirls at Midnight print the best. I absolutely love the Bursting Red Poppy Print! I like Hilaria Galleries on Facebook! I follow Hilaria Galleries on Twitter! My favorite print is the undulating swirls at midnight tree! I love all her prints, I especially like The Olive Perch. my other favorite is clearance. thanks for the giveaway. I especially like the Olive Perch. I follow you on twitter (113Elle). My favorite painting has to be Literary Captivation; I find it absolutely stunning. :) It reminds me of myself, a lot, since I love to read. My favorite print is Poppies at Dusk. It was so incredibly difficult choosing one print that I like, but I feel in love with "Flora and Fauna on Deep Azure." I love the "perched among the cherry blossoms" print. I like the Olive Perch print. Hi, gorgeous giveaway. Please enter me. I am already follower trough google friend connecter name liz. Monogram are always my favorite! I would love to win Literary Captivation, for my 6 yr old daughter's room. She loves to read & the color would go so nicely in her room. I LOVE bringing in the last of the wash! Wistful Evening...Print of a Little Girl Swinging at Dusk by HD GREER is my favorite, thought I do love the pin-up style prints. My favorite is the Literary Captivation. I love the Vertical Vista. Gorgeous. I "like" Hilaria on FB (under my name, Piroska). I follow Haute Whimsy via GFC. I love Tempest in Blue and Green. Thanks for the great giveaway! Oh, I love the art in her shop! I like Bringing in the Last of the wash best. I follow Haute Whimsy via GFC publicly as Mimi G.! I love A Quick Walk in the Autumn Woods. I love Vibrancy in Lapis Lazuli. Thank you for the lovely giveaway. I also love the Poppies at Dusk print. I love the ABSTRACT MODERN Art by HD GREER Print..8 by 10...Miro and Klimt Fused Series. I loved Serene Citrine...HUGE Original Abstract Contemporary Modern Art Diptych Painting by HD Greer. I like Crimson Resting. It's somehow "invigorating." 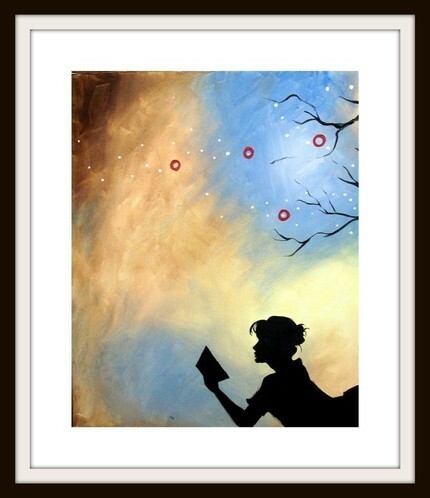 Wistful Evening...Print of a Little Girl Swinging at Dusk is lovely. I like the Grand Oak at Close of Day. Among the Birches..ABSTRACT MODERN Art by HD GREER Print..8 by 10 caught my eye. Thanks for the wonderful giveaway. I am a GFC follower. Thanks. My favorite is the Abstract Modern Art by HD Greer Print 8x10 Miro and Klimt Fused Series.